Jesus, as the New Testament attests, utilized the power of God the Father to perform many miracles during his earthly ministry. These supernatural events, as Christ often said, are evidence not only of his calling and commission directly from God but also of his own divine origin. Incredibly, there are four Greek words used in the New Testament to designate or describe miracles. The Greek word Semeion (Strong's Concordance #G4592), which is sometimes translated as "sign," (Matthew 12:38 - 39, 16:1; Mark 8:11; Luke 11:16) is used to validate a divine commission, to attest to a message from God or bear witness of His presence. Terata (Strong's #G5059), translated as 'wonder' in some New Testament translations of Acts 2:19, denotes events or miracles that are astonishing for humans to see. Dunamis (Strong's #G1411), another Greek word in the New Testament used to describe miracles, means force or power. It refers to events that are clearly caused by someone possessing superhuman power that is supernatural in its origin (Romans 15:19, 2Thessalonians 2:9). The last word in the New Testament used to refer to miracles in the Greek is Ergon (Strong's #G2041). This word, often translated as 'works,' refers to the deeds of Christ (Matthew 11:2, John 5:20, 26, 7:3, 10:38, etc.). Apostle Paul's sense of humor! 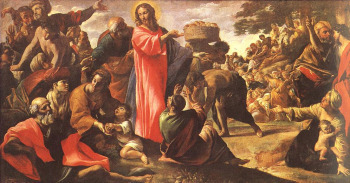 After John the Baptist is martyred by Herod, 5,000 people are miraculously fed from just five loaves of bread and two fishes (Matthew 14:13 - 21, Mark 6:30 - 42, Luke 9:10 - 17, John 6:1 - 13). When was New Testament written? Why were the disciples sent out in pairs? Fascinating trivia on Jesus' life!